Large, yellow-centred semi-double violet/blue daisies. 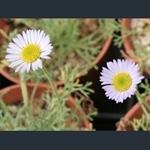 Yellow-rayed daisy flowers over hairy, linear leaves. 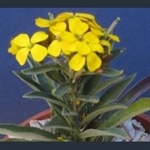 Perennial 'Wallflower' with light lemon yellow flowers and a prostrate habit.